As the Jersey Shore enters its third summer since superstorm Sandy, another milestone has been reached in the Bayshore’s recovery. The Affordable Housing Alliance (AHA), a nonprofit dedicated to expanding affordable housing, began the Bayshore Bungalow Program in the wake of the 2012 superstorm to provide a cost-effective opportunity for homeowners to recoup some of what they lost. “We’re very pleased to be here today to have a replacement home for one of the homeowners who lost everything in the storm three years ago,” Donna Blaze, CEO of the housing alliance, said at the June 11 ceremony in Union Beach. The bungalows — modular homes that come in five different models — start around $150,000, a price that includes design, permitting and full construction. Homeowners may also be eligible for grant subsidies for the homes, which meet state building codes as well as requirements for the New Jersey Rehabilitation, Reconstruction, Elevation and Mitigation (RREM) grant program. The Union Beach bungalow is one of 15 planned so far in Monmouth County. Two are currently under construction in Aberdeen and Highlands, according to Blaze. Brenda Ross-Dulan, a regional president for Wells Fargo, presented AHA with a $125,000 check at the ceremony to help fund those projects. While 15 bungalows are planned, AHA will build as many bungalows as possible with the available resources, according to Blaze. 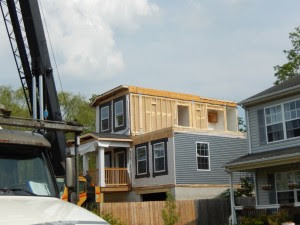 Other organizations involved with the Bayshore Bungalow Program include NeighborWorks Capital, Rebuilding Together, Pro Bono Partnership, Hurricane Sandy New Jersey Relief Fund, Robin Hood Foundation, Statewide Custom Modular Homes, the St. Bernard Project and Next Step. Keith Getter of NeighborWorks America, which financed the construction of the Union Beach home, said the Sandy recovery is entering its final stages and all of the work of the past 2 1/2 years is beginning to avenue for financially exhausted families. Union Beach Mayor Paul Smith commended the efforts of the volunteers and lauded the first bungalow as another piece in the recovery of a borough that is now dotted by open space and characterized by a slew of elevated homes near the waterfront. The bungalow is also raised and has a place for a lift to be installed. Smith joked that the town would be renamed “Union Stairs” because of the extensive elevation projects that are ongoing throughout the borough. Dave Suttles, who would soon be moving into the bungalow on the lot where he lived before Sandy, stepped up to the podium to say a few words to the people who made his family’s new home a reality. Suttles recalled the help his family received from people as far away as Maine in the immediate aftermath of the storm. He said their support was invaluable in such a trying time. “It’s just been an unbelievable experience,” he said.